Beach Soccer ltd company was founded in November 2015, with a goal to focus on beach soccer in Serbia. However, the idea of starting this sport professionally developed after European Games in Baku, where beach soccer showed all of its potential. Not long after, a contact with Alex Soriano, the main executive of Beach Soccer Worldwide, a FIFA agency for competitions and development of beach soccer, was established. Mr Soriano visited Belgrade during the August of 2015. He was able to personally see all the potential of Ada Ciganlija as the ideal place to hold the games of beach soccer. It would be modest to say that he was thrilled with what he saw then. What came next was the invitation for Belgrade party to visit Dubai during Intercontinental Cup, where it was agreed that Belgrade would be a host of Euro Beach Soccer Cup during the summer of 2016, where would Serbia compete with seven other national teams. This ambitious project received a significant support of the Ministry of Youth and Sports of the Republic of Serbia, and the City of Belgrade, helping achieving all the pre- requirements of the realization of the idea. What should be specially emphasized is that Beach Soccer ltd received the support from the Football Association of Serbia also. When it comes to the organization behind beach soccer in the world, there are two different models. According to one, football associations take all of the duties with the organization behind beach soccer. The other one enables private entities who are registered for this kind of sport activities to take care of this sport discipline. The other model, which is being applied in England and Switzerland was also used in Serbia. Left to right: Miloš Joksić, Marko Dimić, Slobodan Stefanović, Branislav Mitrović, Aleksandar Višnjić, Zoran Čanak i Aleksandar Radošević. Left to right (crouching): Dejan Stojadinović (pomoćni trener), Mihajlo Jovanović, Marko Muslin, Aleksandar Radosavljević i Mile Dejanović. CEO of Beach Soccer ltd company is Aleksandar Radošević. He is one of the pioneers of beach soccer in Serbia. 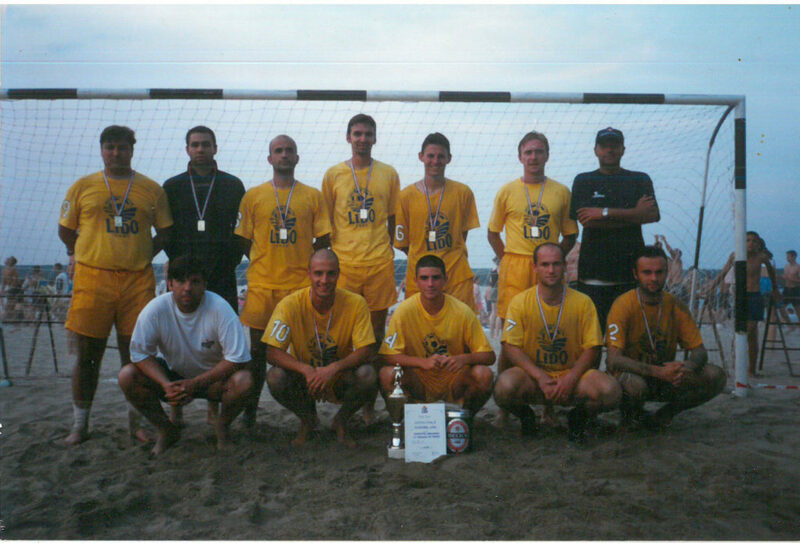 Namely, at the beginning of this millennium he won two tournaments in beach soccer in Serbia as a coach. Those were first tournaments organized in Lido. Aleksandar lead Diadora Lion team.